Background: The conserved Wnt/β-catenin signaling pathway is responsible for multiple functions including regulation of stem cell pluripotency, cell migration, self-renewability and cell fate determination. This signaling pathway is of utmost importance, owing to its ability to fuel tissue repair and regeneration of stem cell activity in diverse organs. 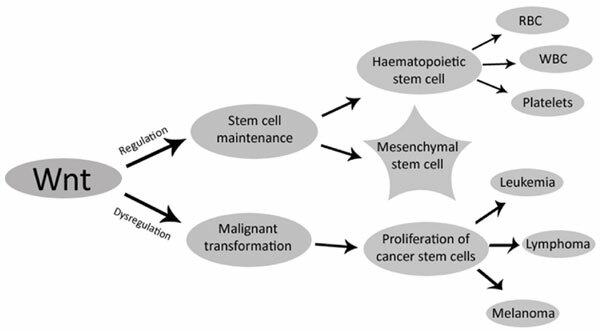 The human adult stem cells including hematopoietic cells, intestinal cells, mammary and mesenchymal cells rely on the manifold effects of Wnt pathway. The consequences of any dysfunction or manipulation in the Wnt genes or Wnt pathway components result in specific developmental defects and may even lead to cancer, as it is often implicated in stem cell control. It is absolutely essential to possess a comprehensive understanding of the inhibition and/ or stimulation of the Wnt signaling pathway which in turn is implicated in determining the fate of the stem cells. Results: In recent years, there has been considerable interest in the studies associated with the implementation of small molecule compounds in key areas of stem cell biology including regeneration differentiation, proliferation. In support of this statement, small molecules have unfolded as imperative tools to selectively activate and inhibit specific developmental signaling pathways involving the less complex mechanism of action. These compounds have been reported to modulate the core molecular mechanisms by which the stem cells regenerate and differentiate. Conclusion: This review aims to provide an overview of the prevalent trends in the small molecules based regulation of stem cell fate via targeting the Wnt signaling pathway. Wnt ligands, Wnt inhibitors, Wnt activators, leukemia, alzheimer, progenitor cells, DCA, quercetin, XAV939, pyrvinium.